παντοκράτορα: ποιητὴν οὐρανοῦ καὶ γῆς ὁρατῶν τε πάντων καὶ ἀοράτων·. Wonderful words, often translated into wonderful art in Greek churches with Christ as Pantocrator painted in a huge dome dominating the church building as the Trinity is believed to dominate the Universe. The description of God’s creation as everything ‘seen’ (oratōn) and ‘unseen’ (aoratōn) shows that the writers of the Creed had a mighty insight into the nature of the Universe that scientists are only just unravelling. SBS recently screened a documentary How Big is the Universe? This BBC documentary answered the question in three ways. It is bigger than we can see, one, because we can see only the objects that generate light. 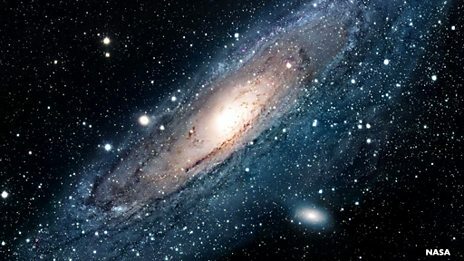 Scientists believe that there must be much more matter than can be seen: they call this invisible matter ‘dark matter’. The metaphor used in the program is of flying over the United States at night. You can see an outline of roads and streets lit up; but there is much more going in the dark than shown by the scaffold of light. Second, telescopes can only ‘see’ 15 billion light-years into the past. What happened beyond is unseen, but that does not mean for scientists that it does not exist. This universe is in principle infinite in size. Thirdly, it was initiated rather like a bubble, and the energy required to make one bubble could well have made many bubbles. There could be an incalculable number of unseen universes as well as our own. Proof of collisions between our own Universe and another of these ‘bubbles’ has been detected, giving credence to this theory. In some ways, these distances are simply unimaginable, although in the past hundred years, most human beings have gone from imagining 20 miles as an impossibly long trip to imagining long-haul plane travel around the planet – 20 thousand miles from Perth to Québec in Canada. The scientists ask us to stretch our imaginations to the size of the Universe: the writers of the Creed ask us to stretch to the size of God. In simplistic terms, if the Universe is so big, then God is bigger. God is celebrated as the Maker of the all things visible and invisible. Poiētēn is the Greek word for ‘Maker’, and you can see its connection to the English word ‘poet’. To be the Maker of all things visible and invisible requires not just a builder, but a Maker with huge imagination; a poet of the extremes. Thank you, Frederick, for letting me read your essay. I love your description of God/Reality as “Love-Bliss”. As a Christian, I have no other avatar/guru than Jesus, who makes the connections with Eternal Reality in his life, death and resurrection. I see myself much more as a seeker than as one who knows the truth; I’m a pilgrim. I’ll not arrive in this life. But let’s not argue. Let’s just share the awe and wonder at the connectedness of the Universe.